RZA delivers a keynote at South by Southwest on Monday in Austin, Texas. Anyone who has ever listened to the Wu-Tang Clan knows that movies, especially martial art films, have been a big influence on the hip-hop group’s sound and style. 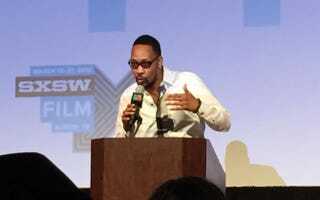 During a nearly hourlong keynote speech Monday at South by Southwest, RZA, the group’s chief founder, shared with his audience how the films he watched as a kid inspired and influenced him as an artist. The first film RZA saw was Star Wars, he said, adding that he connected the most with Obi-Wan Kenobi because the character was a “deep, spiritual guy.” The sci-fi classic provided plenty of inspiration for what would become the Wu-Tang style. “When you look at Star Wars or the martial arts films—the sword swing or the light-saber swing—and then Wu-Tang [having] a sword style of lyricism, you see that all these different films have guided me, informed me, molded me and helped me find my artistic expression [for] music [founded] on film,” RZA said. Throughout the talk, the hip-hop legend took his audience on a tour of his creative journey from rap artist to film-music composer and movie director. RZA’s first step was meeting Chinese-born director John Woo, whose films are sampled on some of Wu-Tang’s early albums. That meeting gave the musician insights into the filmmaking process and revealed similarities between directing and making hip-hop music. “In a way, directors are samplers. Film is their medium of sampling,” RZA said. It was indie filmmaker Jim Jarmusch who brought RZA to his next stop: becoming a film composer. The director wanted RZA to score his 1999 film Ghost Dog: The Way of the Samurai. The only problem was Jarmusch didn’t know how to reach RZA. Fortunately for the two artists, they had a mutual friend. “There was a guy who knew us both … the guy we bought weed off of,” RZA said. Even though RZA did not have any film-composing experience, he quickly learned those skills and applied them to other movies, he told the audience. But it was only when he watched Quentin Tarantino in China on the set of the first Kill Bill movie that RZA’s eyes truly opened to the power of cinema. The musician said he humbled himself and asked Tarantino to take him on as a film apprentice. RZA followed Tarantino around for six years before making his directorial debut in 2011 with The Man With the Iron Fist. “That was a crowning achievement for me,” RZA added.